Competent but not top-drawer stuff. Compressors provide a subtle vintage flavour. Nothing to set the world alight. Despite its longstanding place at the commercial leading-edge of digital sound technology, Yamaha is viewed primarily as a hardware company. The reality of course is that inside all its digital synths, mixers and effects is a considerable amount of signal processing software. It shouldn't be forgotten that Yamaha also owns Steinberg, makers of Cubase, Wavelab and range of software instruments. This brings us to the Yamaha Vintage Plug-in Collection - a series of plug-in bundles consisting of the Vintage Channel Strip, Vintage Open Deck and Vintage Stomp Pack - which comes hot on the heels of the Steinberg RND Portico products endorsed by audio legend Rupert Neve (and with premium prices to match). All of these are based on Yamaha's Virtual Circuit Modelling (VCM) technology and come in both VST2, VST3 and AU flavours. A USB e-Licenser dongle is required (but not included). Yamaha developed 'Virtual Circuit Modelling' (VCM) technology as an offshoot of its research into physical modelling nearly 20 years ago. The principle behind VCM is that the circuit - rather than just the resulting sound - is modelled in order to emulate a given hardware device. Interestingly, this isn't the first time these Yamaha plug-ins have seen the light of day. In 2005 Yamaha offered users of their DM-range of mixers the ability to update the onboard processing with the AE011 Channel Strip, AE021 Master Strip and AE051 Vintage Stomp Box packages - all looking very similar to those under review. We weren't able to do a side-by-side comparison of the old and new, but Yamaha have made no play of suggesting that the current plugs are any better than those on their digital mixers. This could lead to confusion, but does explain the pricing - and raises questions about the nature of 'vintage' plugs, the quality of their emulation, and what we should expect in visual, sonic and functional terms. The Vintage Channel Strip is made up of an EQ and two compressor plug-ins, with each alluding to - but falling short of naming - the look and feel of the 'classic' units on which they are based. The EQ 601 has a rather, '70s-era, Neve appearance, while the 276 looks like a UREI 1176. EQ601 is a six-band EQ, with two shelving-filters and four fully parametric bands. There is also a Drive/Clean switch for adding 'more analogue' flavour. 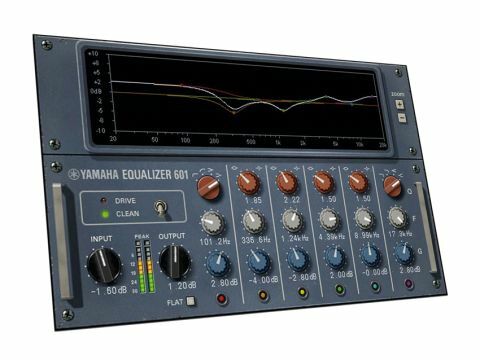 We found this EQ easy to use, and sonically competent, but not especially 'special'. The 276 compressor (just like the original UREI 1176) has a somewhat unusual control system. The Input and Output knobs are used to adjust the amount of compression - the Input knob is a bit like the conventional threshold control in reverse. There's also a switch for managing the make-up gain automatically and a sidechain high-pass filter option, that minimises pumping on bass-heavy material. Incidentally, the VST3 version of this plug-in makes its sidechain input available to a suitable host DAW. We tested this functionality in Cubase, and everything worked as expected. We liked the 276 plug-in, especially when pushed a little hard in the compression stakes. It certainly has the broad sonic feel of the 1176 on which it is clearly-based, though I we'd stop short of calling it a like-for-like clone - like many of these Yamaha plug-ins it lies to the more 'polite' end of the spectrum. Ultimately, Yamaha's new plug-ins are all competent, without offering anything radically different from other more interesting competing products. We might feel differently if they were half the price, but the truth is that both Universal Audio and Waves, to name but two, provide Yamaha with some very strong competition. Surprisingly also, there appear to be no built-in factory presets. If only to get you started, presets are a useful inclusion, and this only reinforces the impression that little effort has gone into the 'added-value' aspect of these plug-ins. On the plus side however, no additional hardware is required and the CPU load in general is quite low, enabling you to use many plug-ins concurrently. We'd encourage you try out the downloadable demos on the Steinberg website and decide for yourself if they help resurrect the 'vintage sound'.